New Horizon, the AMD event that will take place December 13th, is right around the corner and during this show we will finally see a preview of the upcoming Zen CPUs. Nevertheless the guys on WCCFTech have already spotted an upcoming Zen server CPUs, featuring 16 cores and 32 threads. It appears, that although this particular CPU already features 16 cores and 32 threads, it is not going to be the flagship, by quite a margin. According to rumors AMD is supposed to release CPUs with up to 32 cores and 64 threads. These CPUs, which are going by the codename Naples, will compete in the server/HPC market in 2017, a place that is dominated by Intel's Xeon CPUs these days. At the moment the top notch model from Intel is the Xeon E7-8890 v4, which offers 24-cores and 48-threads. 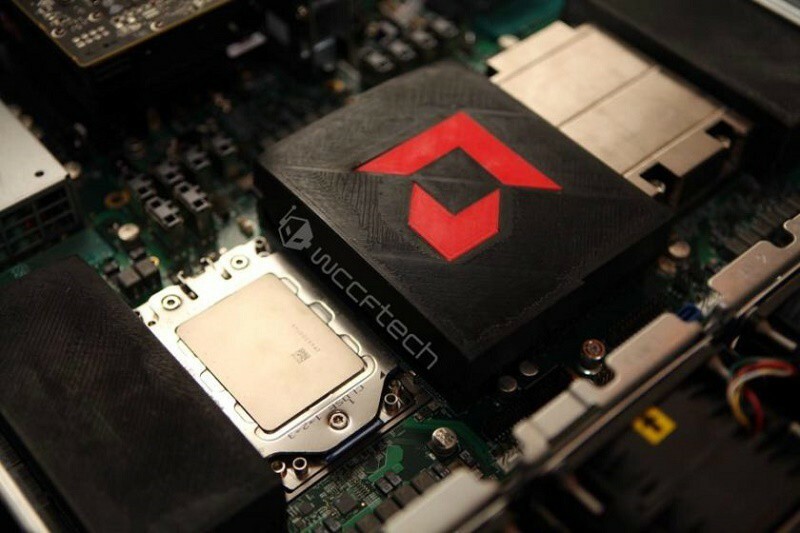 The picture that’s been posted by WCCFTech shows a server motherboard being equipped with two AMD Zen 16-core CPUs and an AMD Radeon Pro graphics card. Both CPUs are cooled by a classic server coolers, in other words we see a standard low-profile heat sink made from aluminum and without a fan, while the air comes from the fans placed inside the rack-mount chassis. What’s also visible is the mounting mechanism which looks quite similar to the one used by Intel. Since 2006 AMD has been using a PGA (Pin Grid Array) socket. It appears that with the new server CPUs, AMD might switch to LGA (Land Grid Array) like Intel. As we already mentioned several times today AMD will host their New Horizon event, during which they’re also going to preview the upcoming Zen CPUs. Today is apparently going to be an exciting day and we will definitely keep you posted.